Photojournalism is what what puts the hop in my step. It's the images that capture an entire story in one single frame that truly inspire me. I love the candid, the unexpected, the raw emotion. I draw my inspiration from documentary photography, editorial photography, nature photography, and architectural photography. I want to get to know my couples as couples, as well as who they are as individuals. I want to know what inspires them, what their dreams are, and how they see themselves. This inspires me to capture their once in a lifetime day in a way that truly speaks to them. On a typical wedding day, I'm a one woman show, capturing the candid, honest, in-between moments of your day. I am a visual storyteller, so my focus is to not only provide you with lovely portraits from the day, but images that will also preserve the feelings from the day. The nervous laughs, the giddy butterflies, the sheer joy. The flowers, your grandma, the dress, your family formals, your dance craze guests, and whatever else that captures my eye that will tell the story of your wedding day. You love all the details, but you don't get too caught up in them. 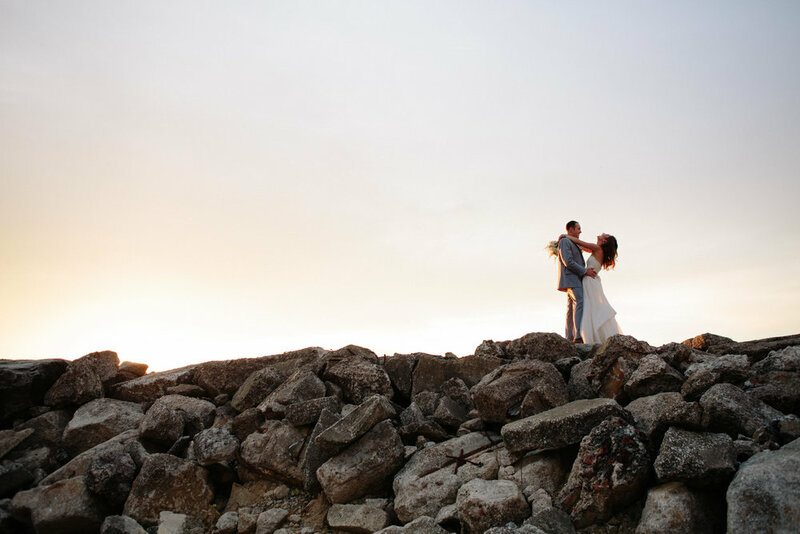 You dream of a gorgeously adventurous marriage, and the wedding is simply the icing on the cake. You'll sneak out with me at sunset for a moment to unwind and embrace all the magic that is going on, just for you! You can't wait to kick off your shoes and hit the dance floor. You know you're only going to wear your dress once, so you take full advantage and make the most of it! Each wedding collection includes me, Brittany, as your photographer and all edited images delivered as hi-res digital download via an online gallery with full printing permission. WEDDING COLLECTIONS BEGIN AT $2800. Brittany's professionalism and honesty helped make the stress of planning photography for our wedding a breeze. She provided suggestions based on her expertise that really made a difference in the flow of our day. She ensured we stayed on track getting to all of the photo locations. Brittany's bubbly personality was a lifesaver when our wedding party was getting cranky about the heat. I received so many positive comments from them about how fabulous she was - Girls and guys alike. The final product captured many moments that I didn't see and those that I did. Looking forward to building an album and completing the process with Brittany. Brittany is just a dream when it comes to wedding photography! We chose her after hearing such good things from other couples, and were not disappointed. She is so professional, and this was reflected during our times meeting with her before the wedding and on the day of! She created our entire timeline that we based the whole day off of, and even helped us tweak things as needed. On the day of Brittany was somehow everywhere and nowhere at the same time! Meaning, she caught every single moment throughout the day (from several angels even! ), but was completely unobtrusive and not at all distracting to guests! The photos, needless to say, turned out incredible! On top of being amazing at what she does, she is a just wonderful person! Her kindness, sense of humor, and warmth towards us and our guests took her from a 10/10 to a 12/10 in my book! We have gotten so, so many compliments and are sure to recommend Brittany for future friend’s and family's weddings! We could not be happier with Brittany and her services! As the groom going into my wedding, one of the things that I wasn't prepared to be over-the-top WOW'ed and excited by was the photographer. Having worked with Brittany for our engagement photos, I knew she would be professional and I knew that the shots would come out incredible. Fast forward to wedding day and BOOM, socks knocked off. I have looked through our wedding album multiple times trying to find pictures I didn't care for or trying to find attendees that weren't captured. This ended up being pointless as Brittany did an excellent job of capturing all facets of the wedding including atmosphere, family, friends, and of course us! Communication, preparation, and planning were all excellent. Brittany was punctual and even stayed a few minutes after planned to grab some bonus shots that she was totally excited to take after the sun went down (we are so happy she did!). Not only is Brittany a top-notch photographer, but she is also a wonderful person that I cannot say enough about. If there was one person working our wedding that was as excited as we were, it would have been Brittany hands down. One of the best things that Brittany brought to the table was control. Having not gone through a full on wedding and photo shoot before, there is no way I could have had the organization or structure that Brittany helped create. She knew exactly how to handle my stubborn groomsmen and made gathering my large family together for photos look easy! If I could give Brittany 10 stars, she would get 11. If you are considering a photographer in the Northeast Ohio area, do not hesitate to book Brittany Graham Photography. We will be return customers for any and all professional photography sessions we need in the future. THANK YOU BRITTANY!